Issued for only one year, the 1941 Douglas is an interesting watch. 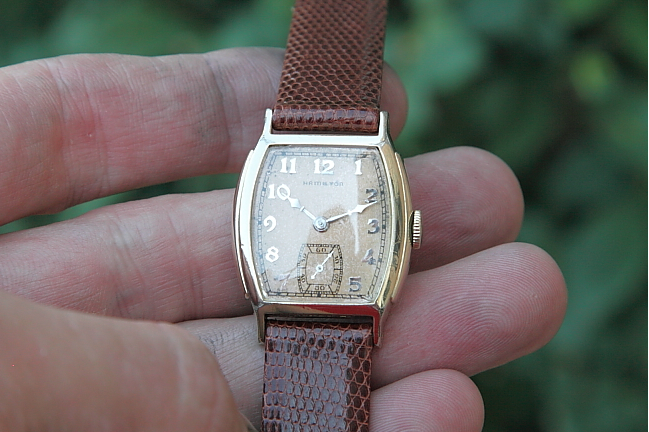 For one thing, it shares a case with an earlier watch called the Morley that was made for two years in 1936 and 1937. For another thing, it features a coral-finished dial with rhodium plated solid gold figures and matching hands. The Douglas came in a 10K gold filled case in yellow with only the coral finished AGN dial. Behind the dial you will surely find a 6/0 sized 17 jewel 987A movement as the earlier 987 movement were obsolete by 1941. I think the Douglas is a nice looking watch and I really like the white solid diamond hands, right down to the second hand. It's an interesting assembly of various colors and if you didn't know that it was an authentic model you might be tempted to think that someone put it together from spare parts. Here's a shot of my Douglas... with just a little bit too much reflection. I should probably take a better picture to show off this fine watch's details. Was this the only mens watch with lance hands? I recent acquired a vintage hamilton, tonneau shaped, that appears to be a Douglas. Also seems somewhat large for a watch of that period. There are a number of 1930's watches with "solid diamond" hands. Spear hands were also popular. The Douglas shares a case with an earlier model called the Morley. The Morley has an AGN dial with yellow solid diamond hands. Looks just like a Douglas - just the colors are yellow.